We bring the world into the classroom, bridging minds and hearts, via arts and education projects based on our shared humanity, peace building and Earth stewardship with primary and junior high students. We build relationships – with each other, with possibilities, and with the Earth. 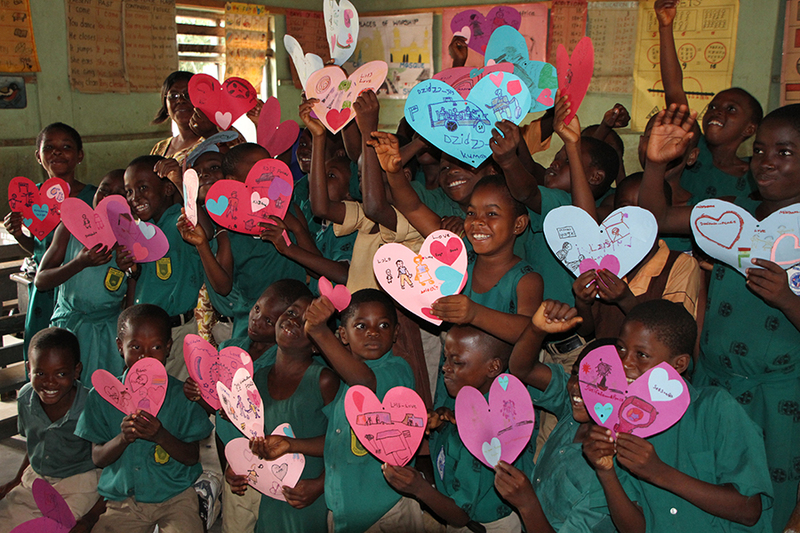 Children Inspiring Hope facilitates two exchanges a year between students in the United States and Ghana, West Africa based on curriculum that is theme and concept centered, enabling project-based learning that is connected to life. In the first exchange, we explore themes around our shared humanity, and peace building, to convey the essence of what it is to be human, and integrate universal human values into the classroom. Students reflect on these themes from their perspectives, share ideas, and collectively determine what artwork they will create to express their individual or collective class ideas. Volunteer teams travel to Ghana, West Africa to bridge the cultures, facilitating these same discussions, sharing artwork, and documenting the process via photos and videos. Short documentary films created upon return enable deeper connections to concepts, a personal connection to another child and class, and the power of creativity and joy as a pathway in itself. The comparative context, enriched by photos and videos full of joy, enables a deepened understanding of self and how diversity enriches our lives. Students gain a broadened view of the world they are a part of, and from within find compassion for fellow humans through these interactions. Students’ worldview is broadened from these simple, yet profound interactions, and the beauty of our shared connections grows. The opportunity to connect for the second exchange, focused on exploration of environmental topics- Water; Food: Who Are Your Farmers; Trees & Forests of the World; Consumption & Waste- a deeper engagement in subject, and process, occurs. 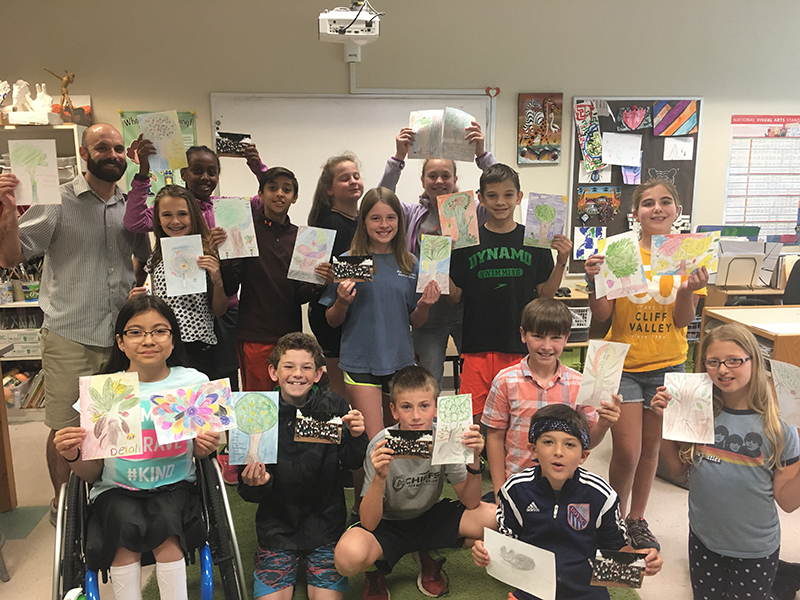 Students explore together the beauty of the natural world, challenges to ecosystems they inhabit, and create positive messages and artwork that inspire Earth stewardship and more conscious personal choices. When we care about each other, and the natural world we inhabit, a springboard for compassionate action is created. When you are connected, you care, and when you care, you contribute. Service is compassion in action. Our service projects allow schools and students to take their deepened understanding and work toward sustainable change. By active engagement and generosity, they are empowered as global citizens who can, and do, make a difference. 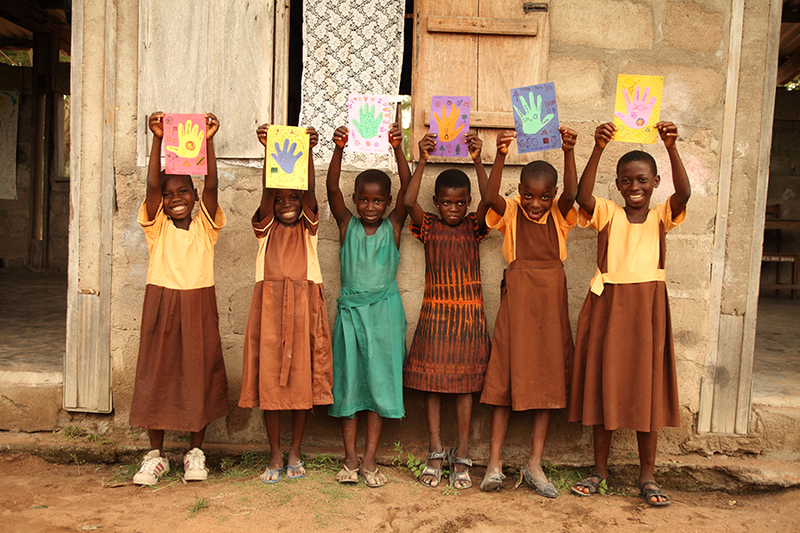 Our Chance to Learn provides scholarships to students in Ghana that otherwise would be unable to attend school. The gift of as little as $50 opens a pathway of possibility for education and a greater chance at meeting their potential. We have students in Primary School, Junior Secondary School, Senior Secondary School, and Nursing school. Overcrowded classrooms inhibit a child’s capacity to reach their potentials. In order to create environments more condusive to teaching and learning, we are engaging in two projects – upgrading our computer lab, and assisting with the completion of schools rooms. We consider water to be a human right. Lack of access to clean water is also a barrier to education and well-being. We are actively working on temporary solutions of water filters, while also building alliances cross-culturally with multi-disciplinary teams, for more permanent solutions. Our Elorm treasures are beautiful beads, baskets, and textiles handmade in Ghana, West Africa. Each item, and artisan, has a story. We create the opportunity to purchase with a purpose, to give gifts that give back, while empowering artisans to support their own children and grandchildren. The deepened social consciousness from lessons can be applied in making consumer choices, whether with us or elsewhere. Meet our artisans, and browse latest items in from Ghana.